An Iowa Garden: Shocking; Just Shocking! Most of the very early spring flowers are harmonious little critters, modestly and quietly pushing their tiny, pale yellow or soft violet flowers up through last year's dull brown oak leaves... and then there is this bright fuchsia hepatica nobilis var japonica, which just opened. I knew something was up when a honeybee buzzed past me wearing sunglasses. Little bees with sunglasses--the image made me smile! Thanks Don for your recent series of early Iowa bloom--we desperately need it after this interminable winter! This hepatica was a new one on me! I agree - the mental image of the bee with shades made me smile, too. What a vibrant pink! I'm hangin gon to that cute image in my brain too ! A wow of a flower, very nice ..
What a lovely flower! I love the structure of this flower, along w/ the colour. I just love the detail on this stunning bloom. This aint no shrinking violet! It is bright! Looks kinda neat against the brown of dead leaves. Just how large is the flower. 1/2"? 1"? Beautiful details in the picture. I also love the mental image of the bee wearing sunglasses. Too cute. Thanks Coach,Nancy,Dee,Joy,Olivia,Melanie, Ki,and Cinj for your comments. I've got several hepaticas opening up now, and they're all stunners! Oh, this just puts my native Hepaticas to shame. I love that color! Wanda... it's been a BAD spring for bees. MMD...I like the natives, too. IVG... there are lots of different colors and both semi and full doubles available, but WOW are some of them expensive! 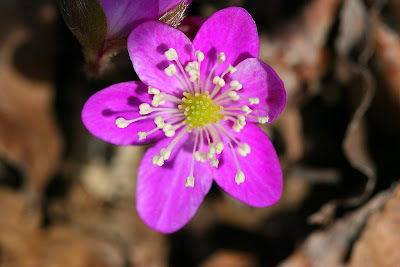 That is brilliantly beautiful, but I would be thrilled just to have any hepatica!